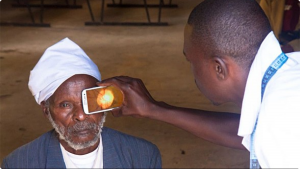 The days are not far where the doctor can diagnose your eye remotely with Telemedicine with the help of your smartphone. Your phone has inbuilt AI-powered program which is based on Machine Learning(ML) to identify and detect disease easily without the need to have a high-end lab and equipment. Diabetes Retinopathy is a serious yet preventable disease which affects the blood vessels in the retina, causing cloudy and blurred vision. This is caused due to high levels of sugar in the blood. These blood vessels can swell and leak or stop blood flow by closing completely. The disease is commonplace as in India alone, by 2030, 79.4 million people are estimated to suffer from Diabetes Retinopathy. The manual diagnosis for Diabetes Retinopathy includes procedures such as the dilated eye exam, Fluorescein Angiography and Ocular Coherence Tomography (OCT). These diagnostic methods are manual and need trained specialists to conduct them. Hence, precious time is lost as these procedures are time-consuming and this, in turn, may delay the prognosis. Tech Vedika developed a solution where eye specialist can diagnose Diabetes Retinopathy with a mobile camera, based on AI/ML. Although our solution is not intended to act as a replacement for an ophthalmologist or optometrist, it helps to reduce the diagnosis time and helps doctors take technology-backed decisions.